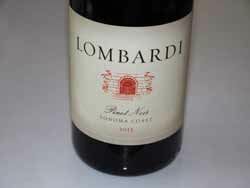 Tony Lombardi, while working in 2013 as the Director of Brand Management & Public Relations at Kosta Browne Winery, launched his own eponymous label producing small lots of Chardonnay and Pinot Noir from Sonoma County vineyards. The first vintage was 2012. In May 2015 he left Kosta Browne to spend more time on his Lombardi wines and other wine projects. The winemaker is Cabell Coursey. The winery is not open to the public and does not have a tasting room.